Have you heard the Earth shattering news (to be read with sarcasm)? Your zodiac sign may have changed! So if you were once a Pisces, like I was, you may now be an Aquarius. To make things worst, there’s now a thirteenth astrological sign, Ophiuchus, and it’s one that nobody can figure out how to say. I can’t imagine how many relationships are now in peril, how many new found jobs will be lost, or how many missed opportunities now exist. So what are we to make of this nonsense change? Hell, why is this happening now after thousands of years of studying the stars? The truth is, to astronomers this is old news. Very, very, very old news. Slow shifts in astrological signs and even a thirteenth zodiac member have been known for two millennia now. To understand why this is really nothing new, let’s break down all the players in the story. We begin with a discussion on constellations. A constellation is really nothing more than arbitrary grouping of stars that lie in close proximity to each other on the sky. The stars that make up a constellation are not necessarily—and in fact rarely are—physically connected or even related to each other. For example, the stars that make up one of the most recognizable constellations Orion (shown to the right), are at all kinds of distances. The bright red star on the top left (Betelgeuse) is 429 lightyears away while the bright blue star on the bottom right (Rigel) is 777 light-years distant. If you were to travel to another nearby star in our galaxy, then Orion would look completely different. From a historical perspective, stars found their ways into constellations because ancient cultures would relate the apparent star patterns to mythological beings and tales. The use of constellations have not been forgotten by modern astronomers. However, their purpose has change. Today constellations play the same role as borders do on Earth. Just as political boundaries are used to identify large regions of land, constellations allow astronomers to quickly describe sections of the sky. 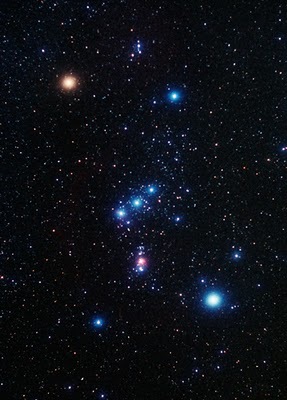 If an astronomer says they’re observing the star Beta Orionis, it’s immediately known that the object being studied is the second brightest star in the constellation of Orion (beta being the second letter in the Greek alphabet and Orionis designating the Orion constellation). An obvious problem with this approach is that constellations are usually identified by a small number of bright stars. What about all those dim, overlooked stars that lie in-between the constellations? To resolve this problem, in 1930 the International Astronomical Union adopted the constellation boundaries suggested by noted Belgian astronomer Eugène Delporte. The constellation boundaries were chosen such that every patch of the sky falls within the jurisdiction of one and only one constellation. Today there are 88 official constellations recognized by the astronomical community. The below figure shows the constellation boundaries in the region around Orion. During the daytime hours stars cannot be seen because the Earth’s atmosphere spreads the Sun’s incident light across the sky. (By the way, this is why the sky is blue.) If we could remove this atmospheric effect then we would observe the Sun “in” a particular constellation. The thirteen constellations that the Sun passes through during the course of the year are collectively known as the zodiac. Yes I said thirteen. 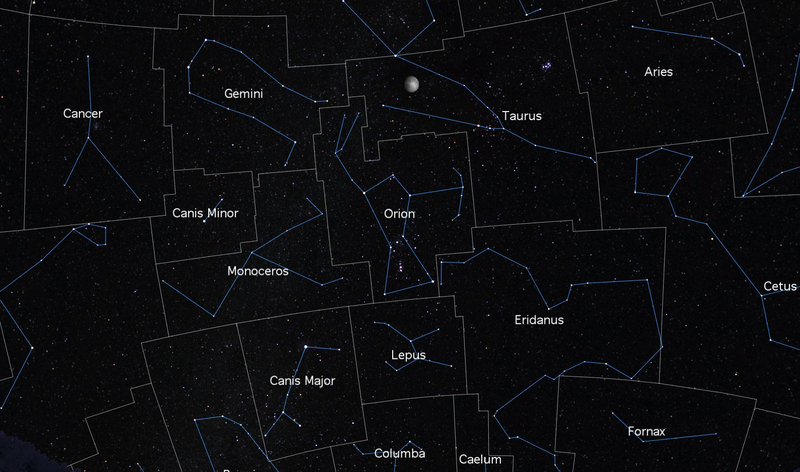 During the early part of December the Sun passes through a region of the sky assigned to Ophiuchus. The figure below represents what the sky would look like at noon on December 11, minus that atmospheric effect. 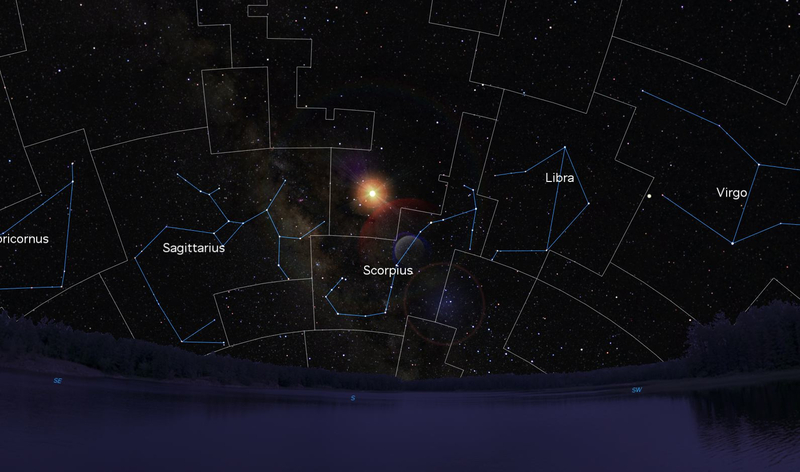 Notice that the Sun is not within the official boundaries of Scorpius, which is the normal astrological designation assigned to this time of year. The unidentified region of the sky is Ophiuchus. The reason it’s unidentified is that even in Starry Night, the program I used to produce these figures, there are only twelve zodiac members. This brings us to the recent news stories about the zodiac shuffle. In a local story, astronomer Parke Kunkle of the Minnesota Planetarium Society, told reporters that the traditional astrological signs have shifted. In reality all that has been done is that someone took the time to calculate the exact dates the Sun passes through the zodiac constellations, including Ophiuchus, and compared them to the generally accepted astrological signs. This isn’t anything new. Astronomers have know for a long time about the existence of a thirteenth zodiac sign. At a minimum, you could argue it’s been known in the astronomical community since 1930 when the official constellation boundaries were accepted. It’s not a stretch either to argue that astronomers knew of this even before 1930 because some of the bright stars of Ophiuchus do dip down into the zodiac. But that’s just the part of the story about the thirteenth zodiac sign. There’s still the bit about the shifting of most everyone’s astrological sign. For that we have to introduce some more science. 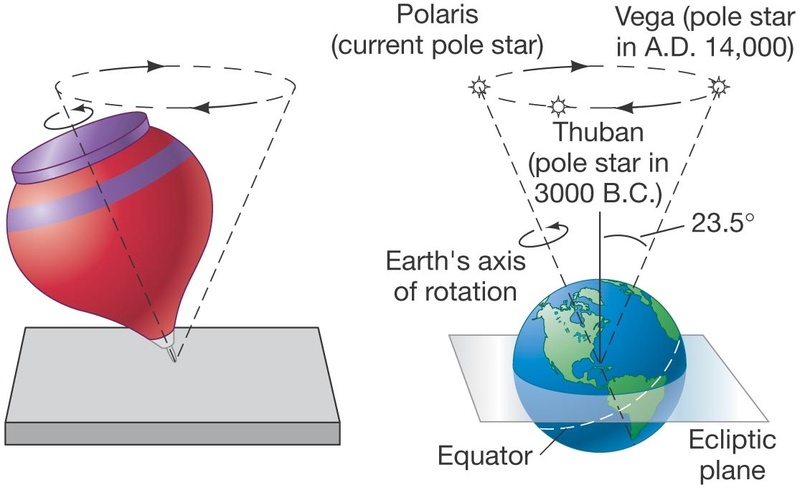 The Earth is continually executing three major motions: it orbits the Sun in one year, it rotates about its own axis in a day, and the Earth’s rotation axis wobbles (precesses). It’s the last type of motion we’re interested in here. Precession is a slow wobble. Think of a child’s top like the one shown to the left of the below picture. A top will spin very fast about a central axis, but that axis will move around in a circle at a much slower pace. For the Earth, the precession rate is very slow. It takes approximately 26,000 years for the Earth’s wobble to complete one circle. The planet’s precession leads to two observable outcomes. The first is that the North Star changes in time. For now Polaris is the North Star, but in the future other North Stars will come and go. 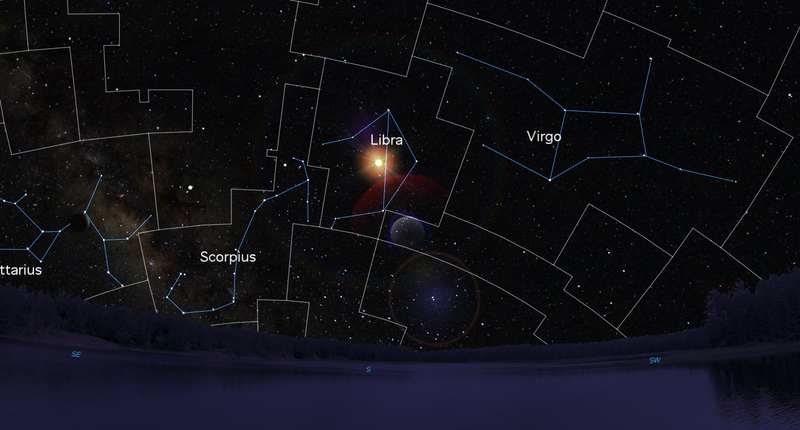 In 12,000 years, the bright star Vega will be the North Star. This image was borrowed from Astronomy Today by Chaisson & McMillan. The other result of the Earth’s precession is that the dates in which the Sun passes through the various zodiac constellations progressively changes. Because the Earth’s precession rate is very slow, this shift is likewise slow. Recall, that astrology has been around for thousands of years which isn’t the complete 26,000 year precessional rate, but it’s enough to offset the zodiac dates by a noticeable amount. In fact, the accumulative shift over the last few thousand years is about one whole constellation. The below figure is the same as before—noontime on December 11—but now the year is 4011. Notice how the Sun is now in Libra? In the two thousands years from today, the Sun has slowly drifted over one zodiacal sign as it has done in the thousands of years since the original astrological signs had been decreed. Much like with the thirteenth zodiac member, the Earth’s precession has been known for two thousand years. So again, the shift in your astrological sign is old news to astronomers. Astronomers now possess such accurate models of the Earth’s motions that they can tell you, or anyone that has or will ever live, their exact astrological sign. What you do with that information is up to you. Unfortunately the reason that these recent stories on changes in astrological signs have gone so viral is that a substantial fraction of the population seems to believe that the position of heavenly bodies have some kind of influence on their daily lives. Most any newspaper in America has a daily horoscope, but not a a regular science section. Ugh.